Portraiture was an important part of Frederick Varley's oeuvre, and these works clearly express his intuitive understanding of his subjects, whether they were beautiful women, family members, patrons or military officers. Varley had painted for the Canadian War Records Office during World War I; his fine 1918 portrait of Lieutenant G.B. McKean is in the collection of the Canadian War Museum. In 1942, while living in Ottawa, Varley approached Vincent Massey and Lord Beaverbrook about obtaining a war commission. While he did not receive an official appointment from the Canadian War Artists’ Committee, he was commissioned to do several portraits of military personnel stationed at Kingston, Ontario. While in Kingston, Varley befriended some artists in the Naval Art Services, who invited him to share their studio. In the area at the time was the artist Harry Kelman, who later went overseas with The Navy Show. Although here he is formally dressed in his military clothes and hat, Kelman's pose is informal, and his expressive face indicates a lively and humorous personality. Typical of Varley's approach, this insightful portrait pulses with life and spirit. 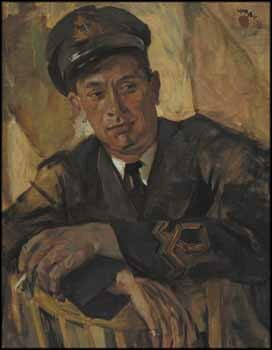 Portrait of a Naval Officer, Harry Kelman is #722 in the Varley Inventory listing, titled as Portrait of Harry Kelman (The sublieutenant).